This is a ca. 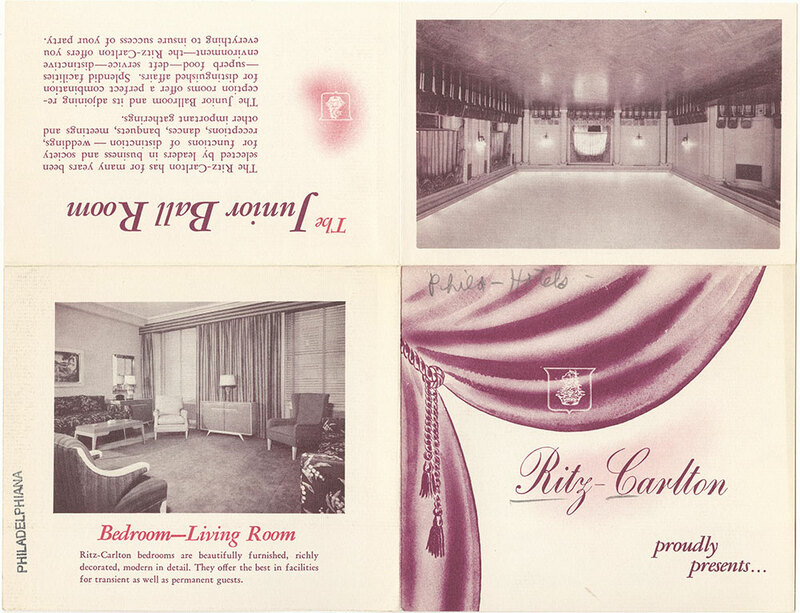 1945 advertising brochure for the original Ritz-Carlton Philadelphia Hotel, designed by Horace Trumbauer and located at the SE corner of Broad & Walnut Streets. The building was completed in 1912, but quickly became so popular, that an immediate expansion to double its original size was completed in 1914. It was one of the most luxurious hotels in Philadelphia for many years--as one can gather from the descriptions and photographs of its hotel rooms and the Junior Ball Room. To see the reverse side of the pamphlet, see item #pdcp01012a. As an interesting side note, the first NFL draft took place at the Ritz-Carlton, on February 8-9, 1936. It was the brainchild of deBenneville "Bert" Bell, the owner of the Eagles since 1933, and manager of his family’s Ritz-Carlton Hotel at the time. The building continued to operate as a Ritz-Carlton hotel until sometime in the mid-1950s, after which it served as an office building for the next four decades. During that period, the original Beaux-Arts exterior underwent many regrettable architectural alterations. However, in 1997 the building was purchased by the University of the Arts, and, using some remaining sections of the original facade as a guide, restored the second through fifth floors to their original appearance. Renamed the Daniel J. Terra Building, it serves a mixed-use purpose of street-level retail businesses below, and the university's educational and performance spaces above.